In her latest novel, Kirsty Gunn takes a brave and original approach. Conscious of the language she uses, capable of creating memorable metaphors and telling parts of the story through characters’ distinctive dialogues, the author makes a bet. She believes that she can almost entirely remove plot from the book and make it worthwhile for the reader to go through over 250 pages (plus another 70 pages of additional notes explaining the background) just on the basis of believable characters and evocative descriptions. Gunn’s risk pays off – Caroline’s Bikini, a novel about writing a novel, is an engaging, humorous and surprising read, original enough to hold the reader’s attention right to the very end. Since she debuted in 1994 with Rain, a coming-of-age story of an adolescent girl in the middle of her family falling apart, Gunn has had a rich and diverse career, publishing nine books, including novels, short stories and essays. In all of her writing, one feature that stands out is the way she eases her reader into the world she creates – making it effortless to instantly imagine the vivid places, characters and events she describes. Caroline’s Bikini tells the story of Evan, an international banker who returns from the US to London that where grew up and where he now falls in love with his landlady, Caroline. He asks his life-long friend, Emily, to write down the story of this unrequited love, a theme that, as Gunn constantly reminds the reader, has its roots in Petrarch’s and Dante’s 14th century works. Even though Evan supplies Emily with countless pages of information, not much of it is substantial. His relationship with Caroline is oddly uneventful, the main plot twist being one visit to his room, when after drinking alcohol and taking anti-depression pills, Caroline complains about life and marriage. Despite its title and apparent story being built around Evan and Caroline, the novel is more about the relationship of Evan and the narrator, Emily. They meet very often, to the extent that writing down Evan’s story overshadows Emily’s work commitments. The emotional tension between the two is never addressed. Instead, throughout the whole book they cruise through countless pubs of West London, sipping gin and tonic and drowning in notes about Caroline. Gunn lets their impatience, frustration, but also excitement show. The two behave like children again, not worried about responsibilities, fully occupied and focused on this one thing that brings them enjoyment. 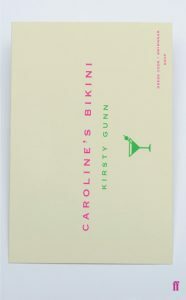 Gunn has created multiple stories within Caroline’s Bikini, carefully connecting characters and places with threads of emotions, dreams and nostalgia. Once you start reading it, there will be nowhere to hide from Emily and Evan, sitting in a pub, sipping their gin and tonic, their smiles like the storyline, suspended in time. Great, informative review, Dominik! 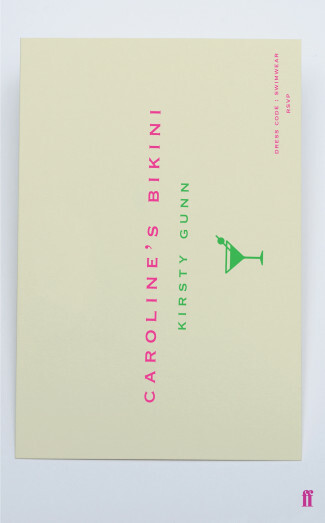 I can’t wait to read Caroline’s Bikini – it sounds intriguing. Where is the criticism in this review? Has it been edited out or was it never put in? Are students so scared of their so-called professors that they feel unable to write a balanced text? “Professor Gunn” is an academic writer at best, and so “Caroline’s Bikini” is tailored to such a narrow audience that one cannot help but calling pretentious. As the “Guardian” wrote rather leniently, the reader is left “waiting for something to happen”. This is not the type of fiction I wish on future generations, on on anybody for that matter. If writers keep climbing their self-made intellectual ladder up to the point where they are, like Gunn, “writing about the concept of writing”, they have to right to be surprised at the public opinion that literature is becoming obsolete. It is people like Gunn who are to blame for this development; our art is not in need of overbearing writers who create their own incestuous ivory tower only to talk down to their readers and their students alike. Thank you for reading the review and leaving your comment. The Guardian review you refer to is not a balanced one either, nor is the Financial Times review. I have not seen your comment there, although it would probably be more appropriate, as these publications cater to a wider audience that is more likely to be disappointed by the lack of plot and the book not being conventional. Instead, you decide to comment on the DURA review, a website which reviews books that are experimental, niche and often original – rarely popular, rarely breaking the bestseller lists. The aim of DURA is to consistently review writers who would be otherwise overlooked, despite creating ambitious and challenging writing. In my review I stated clearly at the beginning that Gunn removed the plot almost entirely – this should be a red flag for anyone who can’t be invested in a story without it. However, it would be foolish of me to think that Gunn did not have the necessary writing skills to include the plot or that she forgot about it. The omission of the plot is deliberate and as such needs to be seen as one of the cards the reader is dealt – cards being the writer’s decisions. In my reviews I focus on how well the writers deliver on the decisions they make at the outset of writing a book. I believe, as I wrote in the review, that Gunn delivers in every way on what she aimed to create. The book leaves nothing to chance and every detail is thought through which shows in the footnotes and additional material. I will not berate Gunn for trying something original if I enjoyed reading it. This is how progress works, people try new things in different ways, some of them don’t work out, some of them do, but without trying we will never move forward. Your dislike towards the book is a subjective opinion, as is my review, and we are both welcome to express those opinions in public, which is a great right we have. Also, referring to your comments about me being scared of Gunn’s academic position – I’m not even a student in the School of Humanities and Kirsty has no influence over my academic career. This is the reason I was given this book to review – so that it’s not reviewed by one of her students who could be influenced by fear – I was not. However, reading your comment greatly dominated by personal comments about Kirsty – perhaps you’re guided by anger over some grade or comment in feedback? Excuse my wild guess if it’s unfair. To finish this already too lengthy response I have to touch on being pretentious. Maybe my review as well as ‘Caroline’s Bikini’ are both pretentious, but neither me nor Kirsty, in our wildest dreams could ever beat your ‘our art’ comment in terms of pretentiousness. Art belongs to everybody, we all can argue about it, get emotional, create it, but let’s not take it away from each other.